Scrap King, based in Tampa Florida, is a full service scrap metal and recycling yard open to the public 7 days a week. We are located near the port of Tampa off 50th street at 5002 Dover Street, Tampa, Florida 33602. We are open to the public Monday thru Friday, 8:00am to 6:00pm and Saturday and Sunday, 9:00am to 4:00pm. Scrap king offers a unique service were we bring the scrap yard to YOU! Our mobile truck will come to your place of business, weigh your material, and pay you cash or check on the spot! This service is only available to business in the Florida area. We currently service air conditioning companies, electrical companies, plumbing companies, machine shops and many more. Call for a quote today! Scrap king also provides a service for cleaning out old warehouses, storage sheds, buildings, Etc. We specialize in commercial, electronics recycling, estate cleanouts, commercial building cleanouts, commercial office cleanouts, scrap metal hauling, and more. 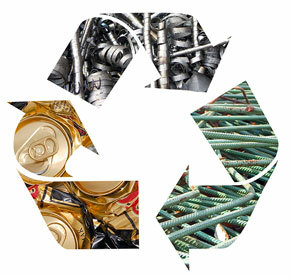 We will send our employees to your location and do all removing of your unwanted scrap metals. Call for a quote today! How much is your material worth? © 2019 The Scrap King. Clearwater Web Design | Visual Realm.